Facebook Style Messaging System Database Design. 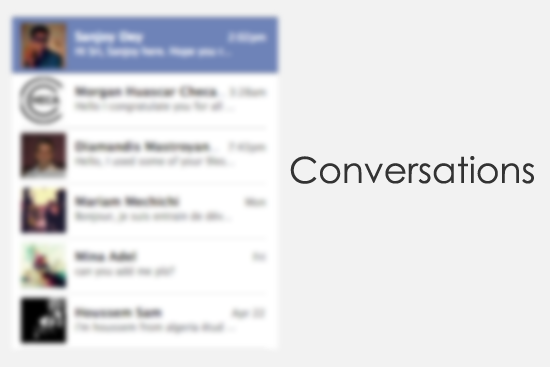 This post explains you how to design the Facebook Style message conversation system using PHP and MySQL. 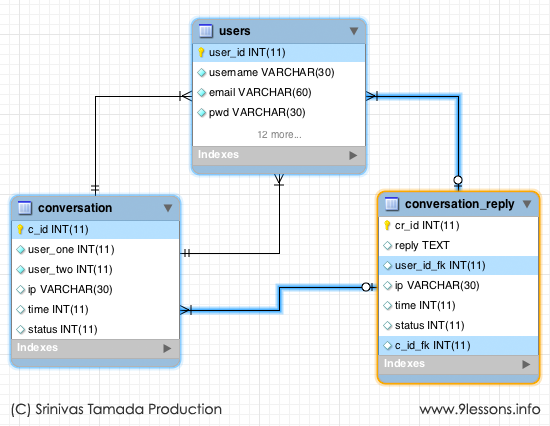 I have been working with messaging system at labs.9lessons.info, take a quick look at this post, how I have implemented database design tables and SQL queries. Login at labs.9lessons.info and try this live demo. To build the message conversation system, you have to create three tables such as Users, Conversation and Conversation_Reply. This following image generated by using Mysql Workbench tool. Data will store in following way, here the password data encrypted with MD5 format. Data relations between users and conversation tables. Take a look at the following SQL statement users table object as U and conversation table object as C . Here user_one = '13' and user_two='13' refers to users table user_id value. Getting the reply results for conversation c_id='2' from conversation_reply table. Data relations between users and conversation_reply tables. The following SQL statement users table object as U and conversation_reply table object as R . Here c_id_fk = '2' refers to convesation table c_id value. Contains PHP code, displaying conversation c_id=2 reply results. Following query will verify conversation already exists or not. Hi sir nice post...but I have one question is it ok to loop a mysql query? I have been meaning to do something like this, and go even further by using APE(ajax push engine) to make have a full chat system implementation. Thanks for the post. This is pretty cool...Thanks a lot. how can we add multiple users in a conversation? I truly love your design and style of blog. I added this to my favorites blog checklist and will probably be coming again soon. why do we have 2 users id in the conversation table? superb design. i like it too much. it's look like a new revolution in message system. nice design and a superb idea..wll done. Excellente! :D a practicar!!!! thanks a lot!! good!, interesting, but how it be to add more users to convertation? But this chat script not a real time like a facebook chat system. What tool you are using for designing a MYSQL database schema? how i can delete my conversation withou deleting the recipient's messages? If i delete mine then the messages will be also deleted from the receiver inbox. The post is fine but i have a question. when i Displaying username arun conversation results the sql query is not showing the correct username. how can i solve this? Dont really like the fact that a conversation is only between to people. In my oppinion your conversations table should only have contained one column with relation to a users, so that you could add as many users to a conversation as youd like. Great sir, thanx for providing such a great Knowledge...Thanx....U have bookmark your site..So impressed to you..
What if i delete one of the messages? If i delete my message, it will be non-visible for other user too. Isn't this a problem? What if user_two deletes the conversation? then it will be deleted for user_one to? no it is refer to current user who send reply. Excellent Post. easy to understand and easy to implement..
great post, what happen with big data? query will slow? are you check it? So many things are wrong with this. Mysql extensions, no deletions, no seen/unseen tracking, complex query required to find conversations with recent replies. This is certainly not Facebook method. It won't offer enough features or scale properly if u decide to implement them with the current schema. You can fix many of your headaches by enforcing that user_one is always smaller than user_two. Thank your for this post. I do however would like to know, how would you manage reply (or conversation) being viewed (or not yet viewed) by the person receiving the message. This database model will not work with large number of messages. c_id_fk is not indexed. so It will look for the whole table. A table can contain millions of messages. so millions of rows. This complete design is bad. The legendary Srinivas delivers again, you're a genius!! To all the people complaining, Srinivas has taken the time out to deliver this tutorial as guide line on how a messaging system works. It's up to you to optimise and secure it. Goodness sakes at least do some work. Great tutorial! how can you post these conversation,so that the other user don't have to refresh the page to see it!!!! Hi Srinivas. Thanks a zillion. To all others who are questioning/complaining, why don't you put an effort into resolving your own queries yourself ? Nice tutorial, It goes inline with what I've developed so far. One thing you are missing is a status for the conversation (read/unread/deleted), a status that needs to be set for each user. 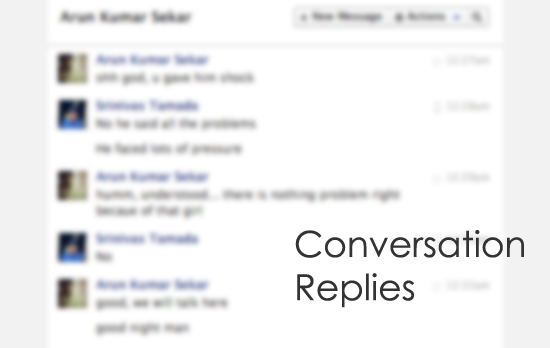 With this status equal 0 you can control the conversation. If user_one delete , We will set user_on_status = 0 instead of delete permanent. I've developed it. This script is getting of the users message area only. Incoming messages can not see on your profile page ( Like Facebook ). You need to go to the messages.php page to see the messages. But i like srinivas database design. If i am going to make this project from where to start and how to start...please help me with some tutorial videos. Sir if you want to count unread message can you help us plz!!!! How check Unread Messages ? if i test the php for showing messages evreything stays blank? can somebody help with the html is need to use? any body help to find all messages sent by other user of status 0 when user 2 want to show his replies. Nice tutorial. I only wanted was database structure. i think its not right. what happened if user1 delete his conversation ? very Great work keep it up and plz sir tell me how to store link of videos in data base and retrieve and play video in webpage when required! Create complete CSS and HTML pages. By this anybody with basic knowledge can understand this script. GREAT JOB DUDE KEEP GOOD WORK. How would you take one long list of messages and insert it into a database like this? rarely a blog helps out, but this one did..thanks! how we can download source code..
but how to manage individual delete of conversation and conversation replies for individual user ?? any examples on 'group chat'? hi its pretty cool but I need a little twisted thing I need one to many chat as well is there any link or help? I was astonishing looking into your blog. Its really good.. But according to this ERD conservation possible between TWO users. So please help me ERD how to design DB for chat in group ? The ERD work perfect for 1 to 1 chat.. It will be great to have an example on Group Chat.. Or Any Idea ?? How can we maintain deleted the conversation ? how to create conversation group? Can we have full source code of the project please? There is possibility to change avatar image ? Have a user level ? 1. Why is time an int(11), should not that be a timestamp? 2. What value should we insert in the ip field of the table conversation? IP of user_one or IP of user_two? This query shows duplication conversation. why?? Sir you just ultimate, awesome work.